Two things that I really love about holidays are having lots of time to read and seeing movies in the daytime when they are cheaper. Charles Dickens is a master storyteller. Two years ago I read A Tale of Two Cities with my ninth graders, and we all thoroughly enjoyed it. After reading A Tale of Two Cities, I needed more Charles Dickens so I read Great Expectations which is one of my all time favorite books. Oliver Twist, just like A Tale of Two Cities and Great Expectations, has lots of characters. However, Dickens knows how to write about ALL of his characters in a way that makes them memorable. There is one character, Nancy, who is a thief, drinks a lot, and is also a prostitute. Nancy risks her life and eventually gets killed in order to help Oliver. Nancy shows that a person can do some really bad things, yet be quite a noble person. Nancy, is a character, because of her tragic ending, who will be remembered for a long time. I was so sure that because she decided to help Oliver, that she would be saved, but that was not the case. On the other hand, there are characters like Fagin, Sikes, and Monks who are evil to the core and show no signs of having any good in them at all. I was sort of hoping that Dickens would redeem those characters, but he didn't; they remained evil. I found poor little Oliver's story to be sad yet engaging. There were times when I felt like I just could not read anymore about Oliver's bad fortune, but eventually, Oliver's story became brighter and quite intriguing. Oliver's life started off wrong, but it ended brightly. 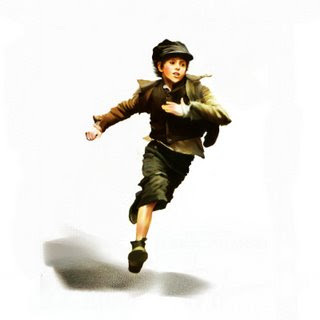 Oliver Twist was written in 1838, and it is still a wonderful story. I am a true Charles Dickens fan, and I look forward to reading David Copperfield, Our Mutual Friends, Bleak House, and many more novels by Charles Dickens. I know that Charles Dickens' name is associated with school books, and many people may think that school books are boring, but I can assure you that most school books are not boring and there are many good reasons why we are still reading them in schools today. I wonder what my readers are doing over this Holiday Break!